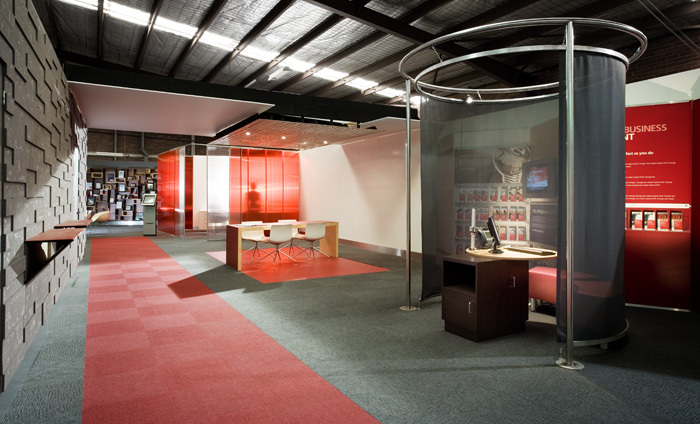 The National Australia Bank had identified a need to create a new branch design, with a real customer focus, that leveraged retail design principles and identified opportunities from new technologies. The first step was to choose a suitable design partner. A limited call for tenders was put out to the market place. Crowd Productions and Studio dp won this process. Dennis Quinn, then Head of Physical and Self Service Delivery at NAB said "We were looking for an innovative design company that could create a unique customer experience within a 'bank of the future'. We did not need a design company that could make the branch 'look nice', but rather an organization that was driven by creating a unique experience via the physical environment. Crowd was therefore chosen". They worked closely with the marketing and brand teams to create an environment that aligned well to their defined customer experience and brand promise." 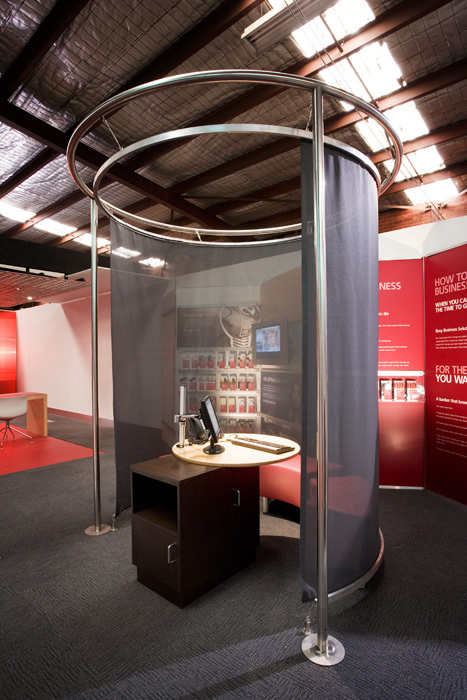 Dennis Quinn and the National Australia Bank team worked closely with Crowd and Studio dp to first develop the concept, then build a prototype to test the concept. and complete a roll out design concept that has now been implemented in a first "live" branch at Victoria point. Dennis observed "Building a prototype was a first for the National Bank but invaluable to test ideas and get them right before expensive implementation. Though it is still early in the Australia wide rollout process the design outcome has been extremely well received by staff and customers, achieving a unique and new customer experience. "In addressing the redesign of retail banking space for NAB we proposed that the bank space is not a blank canvas to act as merely a background to advertising graphics and merchandising campaigns. The space and the people within the space are key actors in creating the real banking experience. As in all retail experiences this must dovetail with the branding messages. 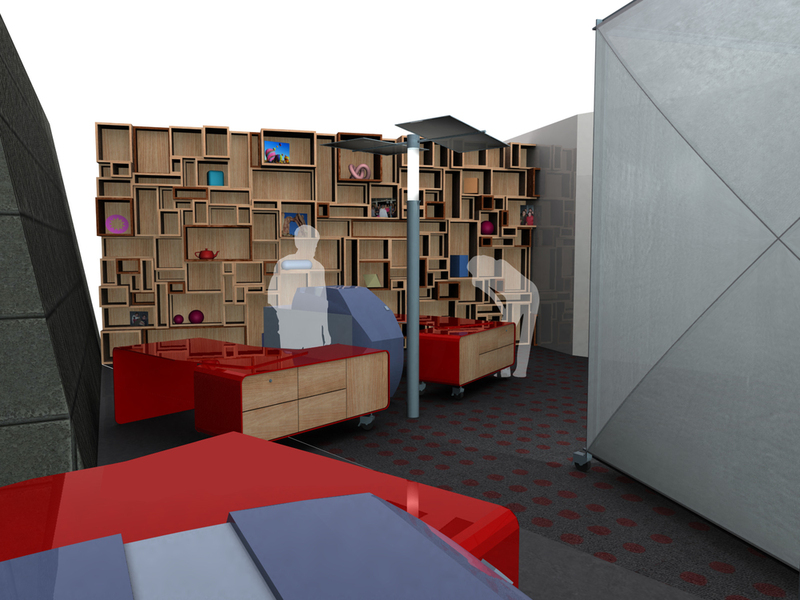 We argue that the physical bank spaces and human resources need to be presented as a core experience. The bank's network in its own right is the anchor of the spatial design. The spatial design must not be a blank canvas enlivened only by two dimensional marketing messages.08.] Creating an outcome aligned to NAB's key business objectives. I.e. : NAB's Customer First initiative. 01] Enhancing the functional experience of banking and information gathering for the customer and accommodating a suite of contemporary technology options designed to increase efficiency and speed for the customer and increase efficiency and security for the tellers and other banking staff. 02] Enhancing the quality and appeal of the working experience for bank staff. 03] Exploring the possible linkages and synergies available with local communities that enhance the banking experience for customers and staff and accommodate these within the built design. We needed to address how that relationship to the local community is expressed. The maintenance of that expression needs to be easy for the bank and for community input and to ensure that the banks intent is coherent. 04] Given the extraordinary range of building stock, an architectural program needed to be very flexible while achieving increased performance and presenting a harmonious and coherent image for the bank. A modular approach both in terms of conceptualising the banking zones and activities but also in designing the actual fixtures was required. 05] Ensuring that the new experiences are coherent and easy to identify for customers. 06] Ensuring that the current disconnect between the bankÕs media presence and the experience of the built bank branch environment was removed. 07] Bringing together all the internal business disciplines into one space; the brand, the people, products, technology, the processes and design. In discussion with the NAB we identified a number of core principles and zones which the bank was keen to pursue operationally and that we should develop spaces for. The banking space is designed to allow NAB staff the opportunity to converse with customers readily in a variety of ways. The bank is designed to express and facilitate connection to the local business and community networks in which it operates and to enhance connection to the wider and significant NAB network. The introduction and deployment of new technology is designed to enhance the ease and efficiency of the banking process. Each core principle has a number of zones allocated to it. 01.1] Exterior shop front zone: combining clear messages and information on the shop front and interactive information kiosks. 01.2] The Exhibition wall: Providing rich and up-to-date magazine style information for customers on life-event banking ideas, hosted by staff. 01.3] Information desks: Designed for providing customers with quick access to staff. 01.4] The Conversation table: Providing a technology free meeting and research area within the bank, ideal for relaxed customer staff communication. 01.5] Teller assisted zone: TCRs [Teller Cash Recyclers or teller activated ATMs] are used to remove the barrier between staff and customers to allow easy communication and staff assistance to customers. 02.1] Web kiosks: A research area for customers to access the NAB information network. 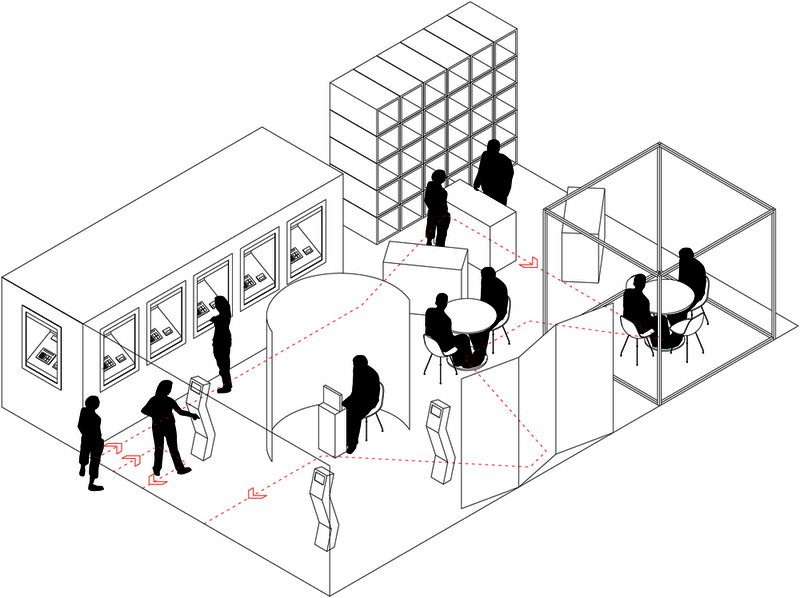 02.2] Meeting pavilions: Private meeting spaces for NAB staff and customers equipped for teleconferencing for rapid connection to the wider NAB network of experience and knowledge. 02.3] The Community Wall: Providing a dedicated area to showcase the activities and achievements of the local community network associated with the branch. 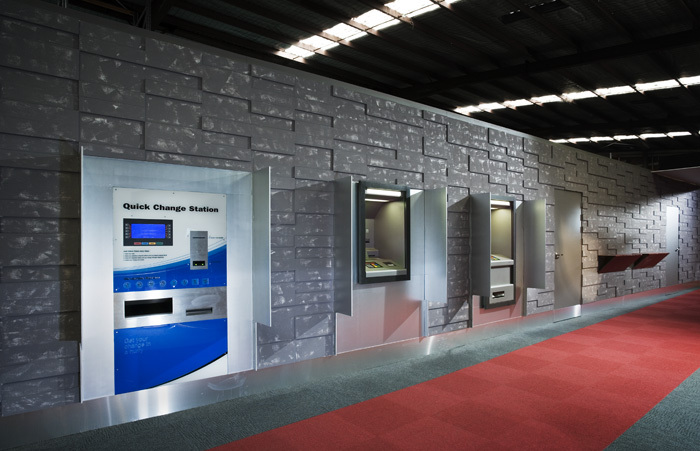 03.1] The Fast service wall: A wall of automatic transaction machines to reduce queuing, teller load and it's right next to the front door. A number of the machines allow 24 hour access. 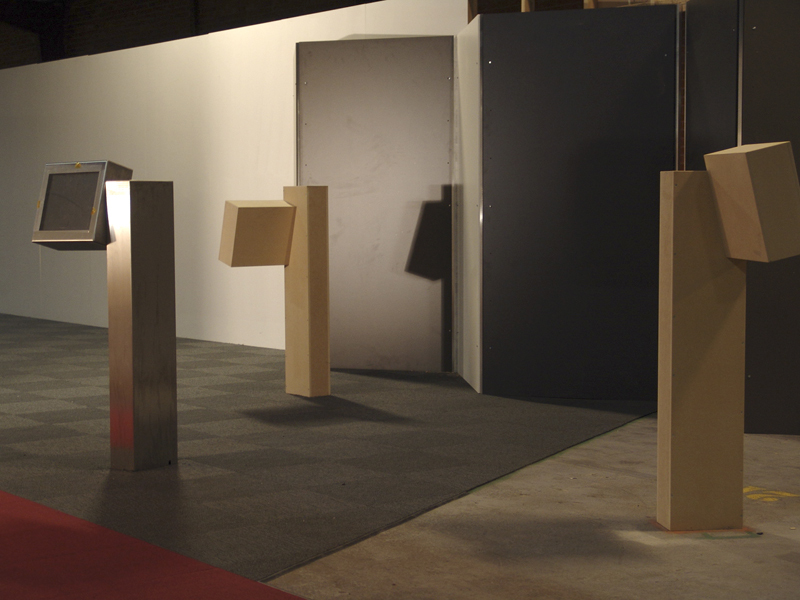 03.2] Media bollards: Designed to give your customers fast and personal access to the NAB information network. They also act as attractors and advertising points. 03.3] The Business Collection zone: A speedy business teller point. This is where the conversation with customers begins. The messages link the reality of the local branch service offer and spatial experience with the broad nationwide NAB media presence. The interactive window displays and a range of digital displays that convey a sense of life, change and interest rather than being static messages. The storefront intrigues passers-by in an intimate way rather than addressing them as though they were in a football stadium. An information desk, where customers can ask for help, is the first port of call. They are especially important at the introduction of this new banking offer, as there will be many questions in customers' minds. This zone is central to communicating the potential relationships the bank can have with its customers in terms of the banks ability to act as a partner in fulfilling customers ambitions. This zone is not about speed. Customers are invited to explore a range of information sources. Rather than the focus being on immediate transactions this space allows for customers to develop their understanding of the possible relations that could be developed with the bank. This is a place for customers to sit down to digest information, children to be entertained while waiting. 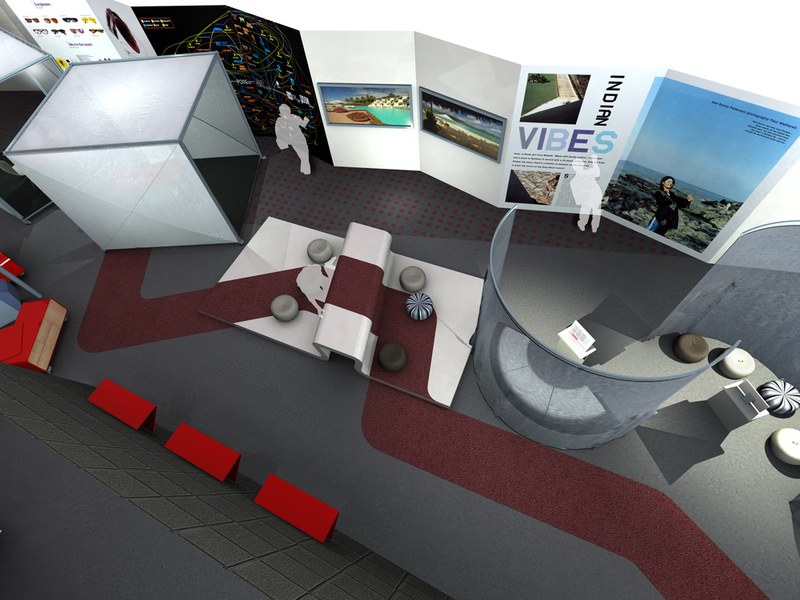 Screens and kiosks in the space will play a variety of information and banking related entertainment content. The kiosks will allow for interactive content and be menu driven. The media bollard/kiosk is a single user electronic touch-screen information point. The content links the reality of the local branch service offer and spatial experience of the bank with the broader nationwide NAB media presence. The content and the range of digital display material are animated and filmic and convey a sense of life, change and interest that is greater than purely static messages. The storefront and the media bollards engage passers-by in an intimate way rather than addressing them as though they were in a football stadium. The bollards are ideally placed in small groups. There is one outside the glazing line available on a 24-hour basis and further bollards inside. Customers can use these while they are waiting or when ever they wish. This zone is central to communicating the potential relationships the bank can have with its customers and exploring the theme of life's potentials and possibilities. The wall sized graphic posters present a contemporary magazine style landscape of information. The custom display system allows the poster elements to be easily changed. The impact of this collecting of all large format graphic display information is to build a very dynamic zone within the bank that also becomes part of the shop window when seen from the exterior. The web kiosk is a semi private research space for the bank's customers. This facility with web browser, printer and keyboard allows the customer to access bank and finance websites and to print out information. The space is a soft space with an intimate domestic scale. The web kiosk can seat three people on small upholstered banquettes. This element is to be a unique identifying feature of the NAB's new retail planning. It is an emblem of modern banking space. This wall is the high security zone of the bank and is emblematic of the position of trust that banking traditionally holds. It starts as the front facade of the bank with the street facing ATMs. Where possible it even projects out beyond the front of the bank or is readily visible as the front facade. It contains the ATM service zone, all cash processing fast service machines, lead teller positions and the strong room at the back. It is only accessible to staff via sophisticated screening technology. The most forward section of the Fast Service Wall is accessible on a 24 hour basis. This is achieved by a combination of cranking the shop glazing line back into the tenancy adjoining the FSW wall and by projecting the Fast Service Wall as far forward as possible. This facility is about providing and communicating the greatest possible efficiency and convenience for customers. It is like the keep in a castle. It is visually identified as a very strong and secure zone representing the banks commitment to the safe keeping of the community's wealth. This will be done through form and materials. The Fast Service Wall is clad in a stone or another durable and strong material indigenous to the local architecture or a locally available material. Integrating all of the high security zones into one such element has allowed us to liberate the rest of the banking plan and take away the more rigorous security demands. This has allowed us to create more fluid and open banking space for staff, customers and their activities. Finally from the locational sense we have sought to develop a range of materials to clad the Fast Service Wall for each of the different geographic communities: CBD or urban, suburban and rural. We are keen to develop a material language that also responds to regional change, allowing the bank to be both a network of connected branches but one where the nodes are expressed as unique destinations rather than entirely homogeneous. The conversation zone contains a number of meeting places for connection within and beyond the bank space. This space is a key gateway to and representation of the bank as a wide network. For the local customer, investigating financial options, the conversation spaces can allow for informal dialogue with staff. For the rural customer needing immediate expert advice, the bank can use internet connection as a virtual gateway to connect customers to expert knowledge, where-ever it resides in within Australia. Every node in the bank network is close to every other node. It's being part of the network that is important. For the city customer wanting to invest in remote country property, they too can also be put in touch with the experts in the network that can help. This emphasis on connection is designed to optimise the value of each employee and the service and knowledge delivery to the customer. By this the bank is valuing its own human resources, to the benefit of it's customers. The conversation table is an area where customers can comfortably wait, do research or engage informally with NAB staff. This is a place for customers to sit down to digest information, children can be entertained while waiting. There is no technology in this area. The focus of this space is real and warm conversation - a place where the staff can simply listen to customers. The conversation table is positioned out in the open and should be placed near the exhibition wall, for reference, should the need arise. The chairs in this zone are placed on either side of the table but staff sit on the same side of the table as the customers, working with them like a great coach. 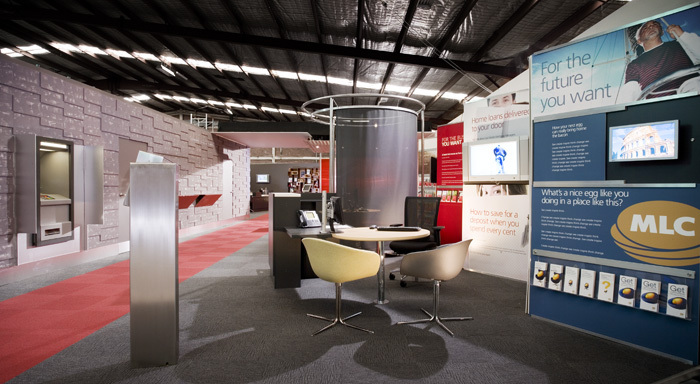 Staff can speak to customers in a relaxed way on neutral territory.Within the full design program these virtually extended conversation pavilions may be mobile or fixed. 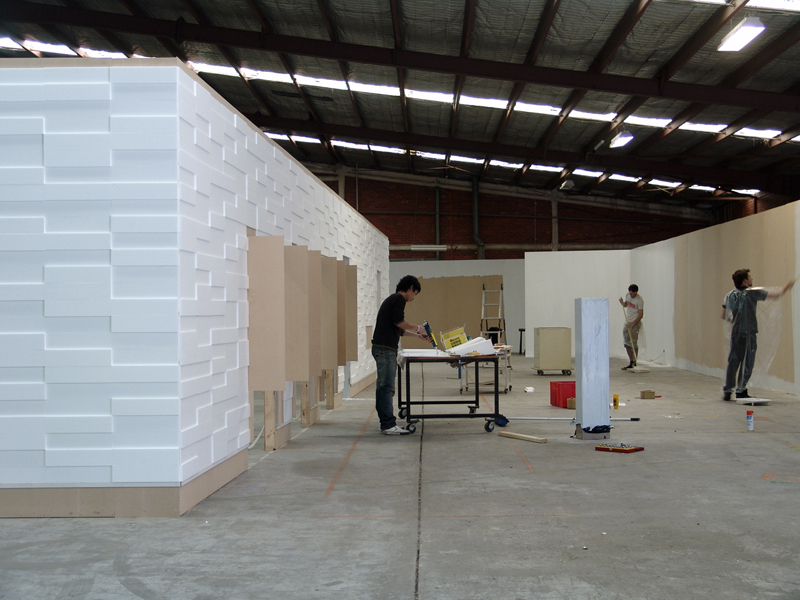 The mobile versions are fabricated off site and can be removed or relocated easily. More can be added as required. 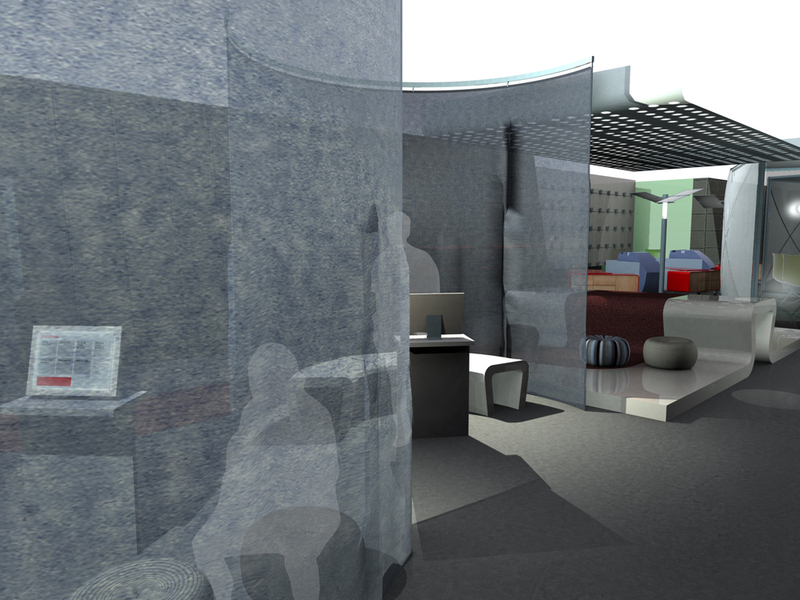 The light mobile rooms have pursued the virtually extended spatial program by being designed as half a room. The key meeting table within the room abuts the end wall where a large video conferencing plasma screen sits. When the screen is on and you are in contact with another conversation pavilion the table is virtually completed in that other location. In your extended table meeting half of the participants are physically present, the other half in another location. The room has two focus points; one reaching into the virtually extended meeting space and one within the room where the space is being used as a venue for entirely local business. The meeting room facilities have been designed to appear open, offering privacy yet accessible. They project into the retail banking space in an inviting way. While the notion of privacy is crucial it is important that they have a comfortable connection to the main public area. This is less intimidating for customers. 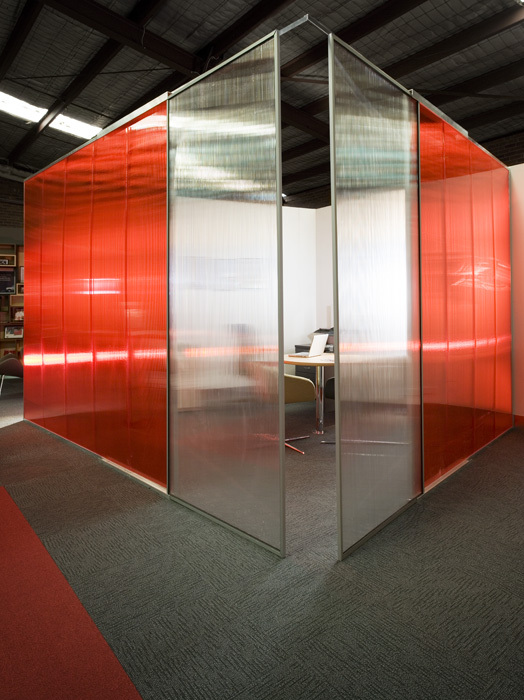 The translucent walls add to the idea of openness as do the doors situated at the corners, allowing selective privacy or communication. Colour is used to create a less formal environment. These spaces are also a key gateway to, and representation of, the greater bank network. While the meeting rooms allow for easy access by customers and staff for a private meeting space they are also seen as spaces where customers can gain access to specific fields of knowledge and expertise from the bank. These meeting spaces can be described as virtually extendable as they can be linked by conference telephones and video conferencing plasma screens. When a conference call is occurring or the screen is on and you are in contact with another meeting pavilion the meeting space is virtually extended and completed in that other location. For the rural customer needing immediate expert advice, the bank can use this virtual gateway to quickly connect them to expert knowledge, where-ever it resides in the network. Every node in the bank's network is close to every other node. It's being part of the network that is important. This connection portal is designed to optimize the value of each employee and the service and knowledge delivery to the customer. By this bank is valuing its own human resources, very effectively, to the benefit of it's customers. This resource will also be used by the staff to locate information within the network. With the appropriate equipment evident, we have identified these pavilions as space prepared for people to do conversations and transactions. These spaces can also be used as private meeting and work spaces by bank personnel. We have designed the banking space with teller positions scattered across the banking chamber to create a much more fluid interaction between staff and customers. The security aspect of the older isolated teller counters is tackled with the introduction of TCR twin safe machines. These provide each teller with a secure cash transaction source. With this technology we have freed up the teller positions from the restriction of a protection barrier as the TCR makes access to cash impossible by unauthorised persons. Tellers are now free to guide customers through the information lounge and to take up concierge and coaching rolls. We needed to address the idea of the individual bank branch as a community and then as part of the greater local community, then as part of the wider bank network community. We also needed to address differentiation for the different communities. The Community Wall is intended to create a space for expression by the local bank staff of their community and its activities within the formal system of elements for the bank design. The content demonstrates how active the bank has been in the community. It also shows projects jointly undertaken by bank and community and celebrates goals and benefits. The alcoves in the store trophies, photographs, certificates and gifts. The Bank of the Future Project was developed from research and initiatives undertaken by the NAB. Crowd Productions and Studio dp developed the spatial planning and strategies as part of that program and as part of the teams developing those initiatives.